and thus seeds and insects and twisted beings became woven into the new beauty that this synthesis was creating. p.s. 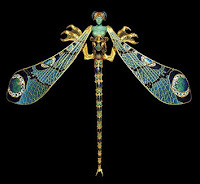 mucha imagined the jewelry and fouquet made it. Very lovely post. I wouldn't mind having one of those dragonflies pin; symbols of eternity aren't they? Did you see the Geisha exhibit at the Asian Art Museum a few years ago? The ancient kimono took my breath away. They were hung as exotic, gorgeous, spirits with wings, misplaced hearts and a life of their own. I looked at the tiny stitching on them and thought about the lives, loves, sorrows, that had been stitched into them. i missed it! abd my library doesn't have the book of her kimono. even the book from the show doesn't have them. but i love your description. have you read jane and mariko's 'ink dark moon' ? Lotusgreen, I love that jewelry! I was clearly born in the wrong era (and the wrong economic class). i think you need to fly to paris right away!!! If I thought they were still making jewelry like this in Paris, I just might do it. However, I think that both the style and the craftsmanship bespeak a bygone era. ahhh, mon cher--mais c'est une exposition grande right now! in paris! all about laliquw!